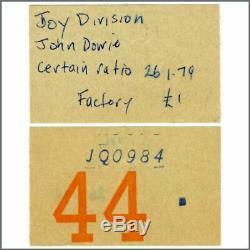 An original concert ticket stub for the Joy Division performance at The Factory/Russell Club, Manchester on the 26. The previous owner has written a list of performers, the date, venue and ticket cost on the reverse. Accompanied by a letter from the previous owner. 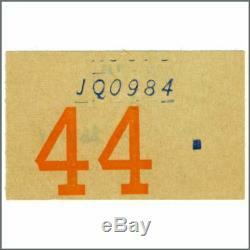 It measures 5.25cm x 3.25 (2 inches x 1.25 inches). Near mint = Almost like new with one or two very minor flaws. Excellent = Minor wear yet looks attractive and is perfectly usable. Very Good = Some wear and tear but overall presentable and usable. Good = Apparent wear and tear but with obvious deterioration of the condition. A plus or minus after the grading indicates that the condition is marginally higher or lower than the stated grade. 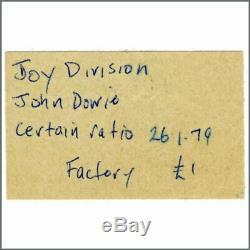 The item "Joy Division 1979 The Factory/Russell Club Manchester Concert Ticket Stub (UK)" is in sale since Thursday, February 21, 2019. This item is in the category "Music\Music Memorabilia\Punk/ New Wave". The seller is "tracksuk" and is located in Chorley. This item can be shipped worldwide.